Packaging (container, label, use instructions, etc. ), shelf life and storage are not the most important parts of veterinary antiparasitics. They usually do not play a role on its efficacy against the concerned parasites either. But they play a significant role in several aspects that are important for users, e.g. quality, compliance and convenience. As a general rule, packaging does not allow to extrapolate whether a given drug is better or safer than another similar ones from other manufacturers. However, lousy packaging or labeling suggest lousy manufacturing, and maybe also lousy development, which can indeed mean poor quality and reliability of the product. If you are looking for a genuine ROLEX watch worth tens of thousands of dollars, you do expect to get it in an attractive and impeccable box, not in wrapping paper. You are right if you do not trust a drug that is poorly packed or labeled. Well-designed labels and clear use instructions will not make the drug more effective than it really is. But they will favor compliance and are indicators of the quality and seriousness of manufacturing. It is important to know that the type of container used for packaging a parasiticide can play an significant role in its stability, and thus in its efficacy and safety. Any formulation, i.e. the final product (with its active and inert ingredients) is nothing but chemicals that can react more or less strongly with oxygen (that may oxidize them), water (that may hydrolyze them), sunlight (that may cause photolysis) and with other materials they come in contact with. If this happens, the active and/or inert ingredients break down more or less quickly, which usually leads to a lower efficacy and sometimes also to a higher toxicity. One of the tasks of the packaging materials (and also of part of such inert ingredients as stabilizers, preservatives, etc.) is to prevent this from happening as much as possible. Glass and aluminum are among the most reliable packaging materials when it comes to isolate them from air. But they are often unsuitable (too fragile, too heavy, too expensive, not collapsible, etc.) for certain packaging. Some plastic materials are rather permeable to air and humidity, but they can be made impermeable through fluorination. Which packaging materials are best for a given product depends on the product itself and on the required shelf life, i.e. the period of time that the product must remain stable (i.e. keep its specifications) after manufacturing when stored under standard conditions. A typical result of poor packaging is paneling, something that often happens to plastic containers stored too long or inadequately. Their walls collapse because something is getting out, which creates a lower pressure inside and means also that its composition is changing. Other symptoms of product degradation are changes in its aspect (color, turbidity, precipitates, etc. ), smell, etc. Among veterinary parasiticides, some concentrated organophosphates (e.g. diazinon) can break down to much more toxic compounds if they come in contact with low amounts of water. They won't do it after normal dilution before use, but it can happen if packed in unsuited containers or if improperly formulated or stored. I'm not aware of other veterinary active ingredients for which this has also been reported, but I wouldn't bet that it couldn't happen under some kind of unsuited storage conditions. Packaging plays also a very important role in marketing. While I was a Product Manager for Novartis in the 1990s, we had a case of sudden sales drop in a rather successful product. We finally found out the reason. A small measuring cup that used to be supplied with the container had been eliminated to save costs. It changed nothing to the efficacy and safety of the chemicals in the product, but many users obviously preferred to have a product with a measuring cup than without it, and changed to competitor products. For veterinary products, the text in the label is quite strictly regulated by the registration authorities of most countries. In many places label texts are becoming longer and longer as the authorities require to include more and more information: composition, indications, target animals, administration, safety precautions, safe disposal, etc. This has some advantages, because knowledge is always better than ignorance. But it also has disadvantages because too much information not always serves the purpose of labels, but distracts users from the essential, which is correct and safe use. Manufacturers can influence the wording and the graphic design of their labels, which has a strong influence on their understanding and thus on the correct used of the product, i.e. on compliance. Mistrust products with unclear instructions regarding what you should do and what you shouldn't. Unfortunately, not only luxury watches and perfumes are falsified. Fakes of veterinary drugs are not uncommon in many less developed countries, and they may find their way to higher regulated countries, e.g. in bordering regions. In the best case such fakes do actually contain the same active ingredients as the genuine product and provide some control. In some cases they contain nothing but water or other useless solvents. In some cases they may be even toxic. A way to recognize the fraudulent origin of a veterinary product is carefully observing packaging and labels: form, color, consistency, etc. Serious manufacturers sometimes include details that are difficult to copy. But not always, because they may increase product costs. Best is also to buy from well-known and reliable suppliers and to mistrust offers from unknown vendors offering unrealistic prizes. You wouldn't buy a ROLEX watch for 100 USD in a street market and expect that it is a genuine ROLEX, would you? Shelf life is a basic feature of any veterinary drug, as well as of human medicines and many other perishable products: foods, cosmetics, beverages, etc. In many countries registration authorities impose a minimum shelf life of e.g. two, or three years and has to be indicated on each container. Within the same country length of the shelf life may depend on the type of product. Shelf-life is often expressed by phases such as "best before...", "use by ..." freshness date ...", etc. A shelf life of 3 years means that a product will keep its specifications (efficacy, safety, aspect, composition, etc.) when correctly used and stored as indicated in the label. As previously mentioned, any drug is a mixture of chemicals that can react more or less strongly with each other or with the chemicals in their environment (packaging materials, oxygen and humidity in the air, contaminants, etc.). Such reactions can cause to the break down of the active ingredient, with the corresponding loss of efficacy. Within the so-called inert ingredients of most drugs, are included specifically to ensure to prevent or delay these chemicals reactions: preservatives, stabilizers, etc. Thus, the period of time a product will remain stable strongly depends on its composition. This is why the content of active ingredient is not only important for any drug, but also its composition. But stability along time depends also on the environment of the product: its container and the gases it is exposed to. Usually most products are packed with a little amount of air in the container. But oxygen and humidity in this air may cause some degree of degradation of certain active ingredients. In such cases the air may be replaced by an inert gas (e.g. nitrogen) or the product may be packed under vacuum. All manufacturers have to run a series of standard tests to investigate the stability of originally packed unopened containers. Usually, their target is not to find out how long the product remains stable, but only if it meets the shelf life imposed by the regulatory authorities. In some cases a longer shelf life can be a competitive advantage, but this is rather unusual. And most manufacturers are not really unhappy if some product is discarded after shelf life expiry, because this is likely to result in more sales. The tests consist usually in storing samples of finished products (usually of each pack size) under standard conditions of temperature (e.g. between 5° and 30°C) and humidity, during the required shelf life and checking their specifications after the storage period: composition, color, aspect, density, etc., whatever parameter that has been determined as part of the specifications. During product development, the initial composition of a product may need to be changed to ensure that the required stability is achieved. Sometimes unavoidable product characteristics will impose special storage restrictions (e.g. store it in a fridge <5°C), as is the case e.g. for vaccines. In some countries and for some products, registration authorities may require investigating stability in opened containers too, i.e. containers that have not been used up after opening. This is important for large containers (20 liter packs, 200 liter drums, etc.) to treat a large number of animals as used in large farms or ranches. Once open, it is not always possible to use up the product within a few hours or days, and it makes a lot of sense to know how long it will remain stable. The reason is that product remains in an opened container are exposed to much more air and humidity and other potential contaminants than the original product in the sealed unoponed original container. Take e.g. a 5 L container. An unopened container has e.g. 5 L product and perhaps 20 ml air (oxygen, humidity, etc. ), i.e. a 250:1 product/air ratio. 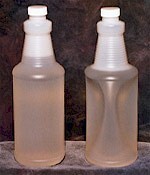 If 4 liters are used after opening and 1 liter is left and stored for later use, the product/air ratio has dropped to 1:4. This is a tremendous difference with the original product. The amount of air is now about 1000 times higher than in the unopened container. Needless to say that this can substantially influence product stability. The same happens e.g. in pipettes for large dogs if they are opened but used several times for smaller dogs and stored opened during months. This is a good reason not to do it, in addition to the high risk of incorrrect dosing. A comparable situation must be expected for solid products (tablets, pills, etc.) once taken out of the blisters. Inside the blisters they are protected from air and humidity. Once outside, they may absorb air humidity, which can significantly affect their consistency and/or palatability. Or microbes (e.g. fungi) may develop inside and spoil them, particularly if they contain some sugars or food extracts (e.g. in chewable tablets for pets). If once out of the blisters you divide such tablets in two or more pieces and store them exposed to air for days or even weeks, these processes may run faster. You better don't do it. What happens after shelf life expiry? There is no way for a user (producer, pet owner, etc.) or for traders to know what exactly happens in a product after shelf life expiry. In many cases manufacturers do not know it either. Most of them will not prolong the stability tests beyond the shelf life imposed by the regulatory authorities, because it costs time and money, and often brings no significant advantage. If they do test the product beyond the shortest required shelf life and find out that the product remains stable for a longer period of time, they will probably claim a longer shelf life as a competitive advantage. If they don't (to boost sales...), they will certainly not tell users that the product is actually stable for a longer period of time than claimed in the label. If they found out that the product actually breaks down after expiry of the claimed shelf life, they won't tell about in the use instruction either, because users are not supposed to need to know it; they are supposed to discard the expired product and to buy fresh one. What to do after shelf-life expiry? For all the reasons explained above, the only reasonable thing after shelf-life expiry is to dispose of the unused product as indicated in the label. Any other option is just too risky, for the animals, for the users, and also for the environment. Blame yourself if you bought too much product and calculate better the next time. 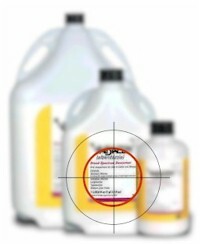 Correct disposal of veterinary parasiticides as recommended in the product label is a must. Particularly for large amounts as used in cattle, sheep, pig or poultry farms. Wild disposal of unused veterinary drugs and/or containers (regardless of whether it is before or after shelf-life expiry) can have disastrous effects on the environment. Most insecticides and acaricides are highly toxic to the invertebrate fauna (insects, worms, crustaceans) in the soil or in water courses. And invertebrates stand at the bottom of the food chain for vertebrates (fish, amphibians, birds, etc.). Some insecticides are even highly toxic to vertebrates: e.g. organophosphates and synthetic pyrethroids are very toxic to fish; organophosphates are also very toxic to birds. Mass killing of fish (by the thousands) in water courses and lakes regularly happened in the past after erroneous, accidental or criminal disposal of cattle or sheep dip wash containing synthetic pyrethroids. Wild disposal is illegal in most countries and substantial fines must be expected if the responsible can be identified. Correct storage has a substantial impact in stability and thus in shelf life. Shelf life claims in product labels are always based on certain assumed standard conditions, typically "store away from excessive heat (e.g. 104 °F = 40°C)", or "store product at or below 77°F (25°C)", or "protect from light", etc. Sometimes it means that the product was not tested under such conditions, i.e. it is not known what would happen and stability cannot be warranted outside the recommended conditions. Sometimes it was actually tested, and found out that such conditions actually spoil the product. Since users cannot know which scenario applies, best is not to check it, but to comply with the instructions. Temperature has a tremendous impact on stability. Best is to keep products in unopened containers at mild to low temperatures (e.g. 68-50 °F = 20-10° C), as constant as possible. The reason is that most chemical reactions that can take place in a product (remember that it is a mixture of chemicals!) between its ingredients, the walls of the container and the air or other gases inside, run faster at higher temperatures. Temperature has also a substantial impact on solubility of the ingredients (also of gases) in solvents. As a general rule, the lower the temperature, the lower the solubility. At too low temperatures some dissolved ingredients may precipitate, even crystallize. Crystallized ingredients often do not get dissolved again if temperature increases, even after vigorous shaking. At high temperatures, some solvents may evaporate, and increase the pressure inside the container, etc. Freezing has to be avoided for most parasiticidal drugs. It can cause precipitation and/or crystallization of active ingredients, but it may also burst the container because many liquids expand when freozend (e.g. water), and some packaging materials make break easily at freezing temperatures. Sunlight is a source of energy (not only because it heats) that can boost chemical reactions inside any mixture of chemicals such as many veterinary drugs. Some active ingredients and/or chemical mixtures can become unstable when exposed to excess sunlight. If a product label includes the warning "protect from light" you should take it seriously, i.e. do not store it exposed to sunlight. A few minutes or a few hours won't harm, but keeping it exposed to sun during weeks can certainly spoil it. A very bad scenario is storing drugs under conditions of strongly changing extreme temperatures, from very cold, to very hot within short periods of time. This can happen e.g. in barns, huts, stables, and other unprotected places, e.g. in early spring or late fall, when the sun can still heat a lot during the day, but frost is possible during the night. It can also happen in arid, desert-like regions where very hot temperatures during the day are followed by freezing temperatures during the night. Under such conditions, both the container and the product inside are exposed to constantly changing conditions of solubility, reactivity, temperature, etc. Such extreme storing conditions can easily shorten the shelf life claimed by the manufacturer under "normal storing" conditions.